After Halloween, Easter is the biggest candy holiday. Chocolate bunnies, candy filled eggs, marshmallow chicks… Where does it end? Sometimes, you just need some candy alternatives for your child’s Easter basket. Because chocolate overload! 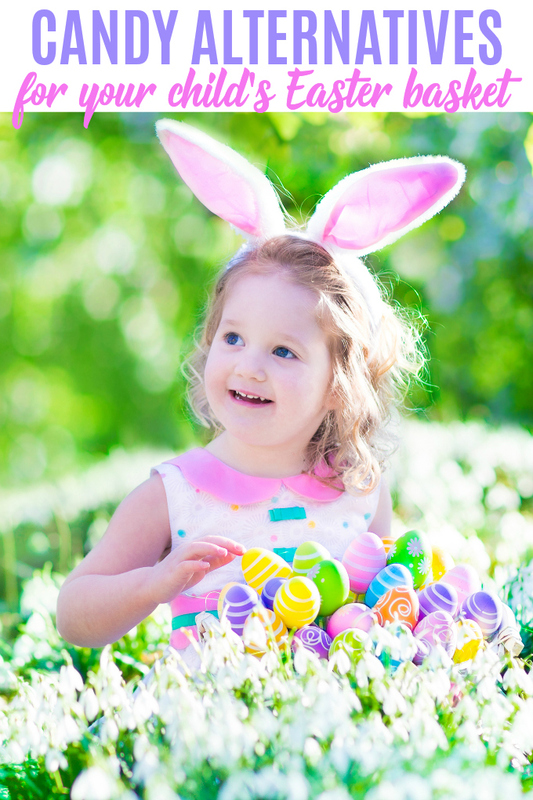 It doesn’t help my resolve to go candy-free when the dollar store was chock-a-block full of Easter candy only days after Christmas, but it is possible to fill an easter basket or host an egg hunt that involves less chocolate and more fun! For older kids, who don’t necessarily buy into the whole bunny routine, but still like getting a basket of goodies, you can set up an epic treasure hunt that they’ll tell their friends about! This definitely beats running around a field like wild beasties, looking for eggs! An age-appropriate scavenger hunt — You can run this for several different ages at the same time by making what each child needs to find a little bit different. When they come back with the basket of folded, clean laundry (who says you can’t put that on the list? ), they win their prize basket. Keep the items they’re looking for Easter themed and make sure you plant enough of them around your house and garden! Treasure hunt — Using clues placed in re-fillable plastic eggs, send the kids from one ‘station’ to the next where they will need to solve riddles—or if you’re mean, math problems—to get to the next clue. The final clue takes them to their basket! A little kid version of the treasure hunt uses paper streamers to create a path they must follow in order to find their basket. Traditional hunt with a twist — Even if you’d rather observe tradition and let them loose in a field looking for the eggs you hid the night before, you can avoid putting candy out there by either using painted eggs, which they must collect and redeem for a prize, or plastic refillable eggs filled with things that will fit! Figurines, lip balms, marbles, tiny games… For all this, you can forgive your dollar store for their ‘post-Christmas but TOO early for Easter’ shelves and load up! What treats go in the basket? Does your child have a favourite hobby? Stuff their basket with the tools of their particular trade. For the budding artist: How about pencils, notebooks, markers and stickers? For the soccer nut: A jersey from their favourite team or trading cards? For the avid horseback rider: Their own horse grooming kit? For the reader: The latest and greatest in age-appropriate paperback novels? For the movie buff: A DVD or gift card for streaming, some popcorn and a promise to join them on the sofa even if they want to see the same movie you’ve all seen 7 times already? Craft kits to keep them busy for a couple of hours! Colouring books and crayons with an Easter theme are always a good option. Since spring is well underway come Easter, get some fun outdoor toys like sidewalk chalk, frisbees, skipping ropes or a new basketball! Get a flower growing kit. With a couple of small pots, some flower seeds (look for flowers that grow well indoors) and some potting soil (or potting material, as usually comes with a kit) and set them to planting and watering their Easter flowers. They’ll enjoy watching them sprout and grow for weeks to come. If that’s a step too far, Easter themed Chia Pets are always hilarious! If your home can stand another one, a stuffed bunny, lamb, or chick is always appreciated, particularly by the younger set! But if you can’t take one more stuffie, how about a blanket or pillow with an Easter theme? A little Easter makeup kit for the tween in your life: lip balms, nail polish in dewy shades of lilac, pink and pale green, and some emery boards; or go all out with some pink hair chalk or temporary colour! White school glue – if you grew up in Canada, you know this as Elmer’s glue! Buffered saline solution – found in the eye care aisle of any drug store, it is different from standard saline solution because it contains ingredients like phosphates, to help maintain its pH levels. In a bowl, pour out the whole 4 fl oz bottle of glue (assuming that’s the size you bought it in—it’s about ½ a cup if you bought the bulk jug!). Add ¼ teaspoon of baking powder and mix well. Now, you can add a few drops of food colouring. If you want to make different colours, do them in separate bowls first. Start adding the saline solution a few drops at a time, while mixing. Keep doing that a few drops at a time until the slime starts to form a ball. Put some of the saline solution on your hands (just a few drops) and start kneading your slime. Just like a good loaf of bread, you’ll get your best slime if you spend some time at this stage and really work it. The stickiness should dissipate after a few minutes of kneading. If it doesn’t, add a few more drops of saline solution. TIP: Add the saline slowly. If you add too much, your slime won’t be stretchy but will start chunking apart. With all of these options, who needs a chocolate bunny? Well, maybe you can sneak just one in there! You could also try these free Easter printables. Have a great Easter everyone!